Note: Click on image to open a large version in new window. Click on underlined links to take you to the product. 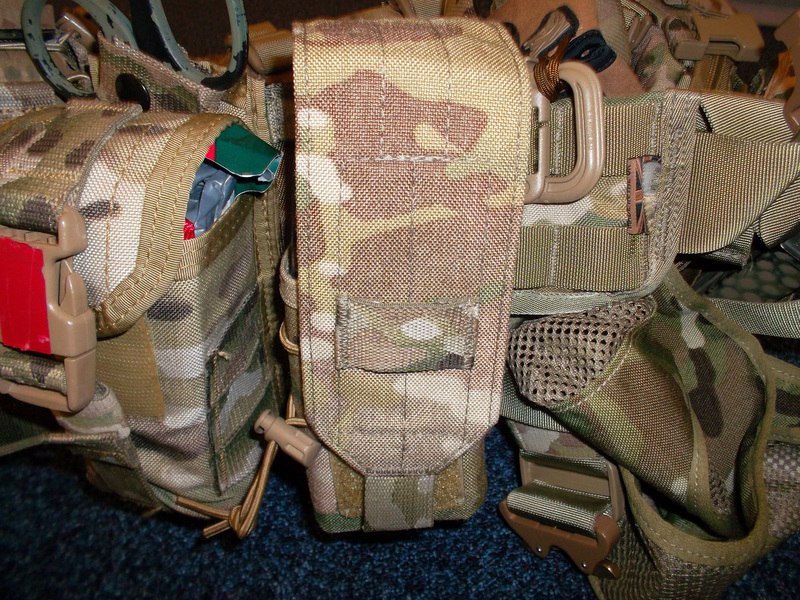 Firstly, a run through of everything that comprises this belt kit, then a breakdown and review of the kit from British Tactical (BritTac) only. 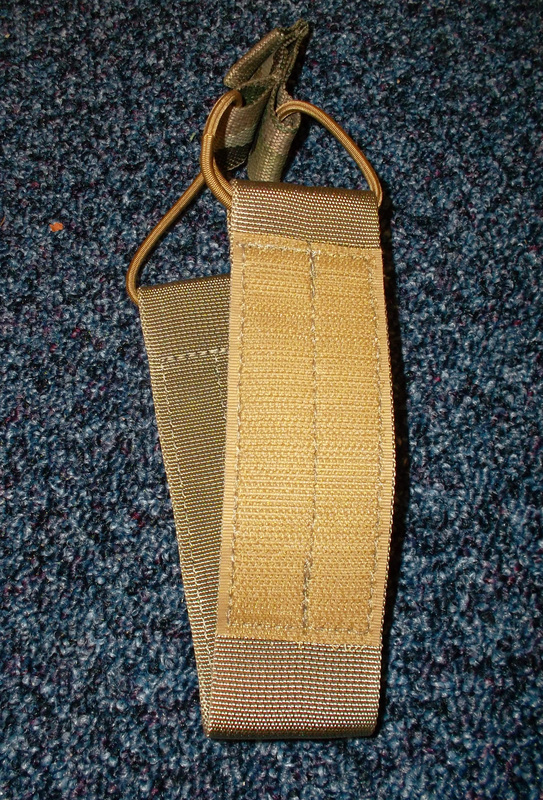 Belt – BritTac two row PALS*, fitted with an AustriAlpin Cobra buckle. 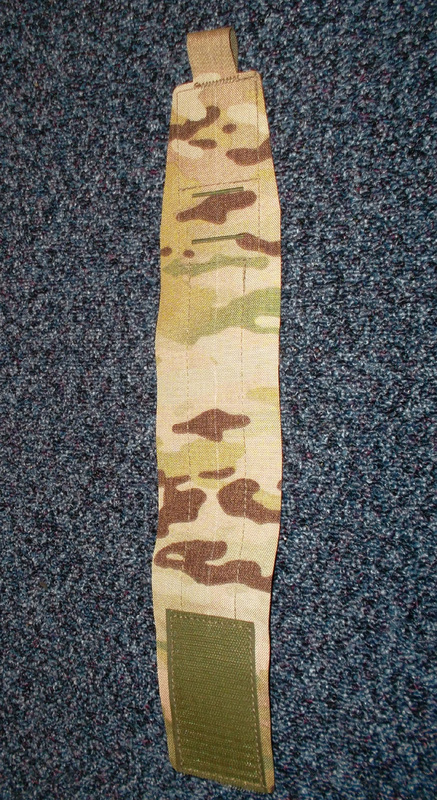 Under Armour Yoke – Vanguard, with a BritTac Sternum Strap. ...Two x Patrol Incident Gear (PIG) Double Bomber pouches. Grimlock and PIG FDT Delta gloves. There are also a couple of Thrym Cell Vaults, some MOLLE* T Mounts (BritTac), webbing loops for neatness(BritTac), random plastic open loops and some 25mm webbing to stop the ‘bounce’ thrown into the mix as well. Two rows giving 26 columns of PALS to play with as I'm large of stature, within minutes of placing the order Dave Stewart of British Tactical was in contact with me to make sure there would be no errors in the design which would be carried into manufacturing as you can imagine it would be an expensive mistake to make, remember the adage “measure twice, cut once”. This was most certainly the case here and the exact position of the loops for attaching the yoke were clarified with the use of drawings. I was initially looking for a roll pin buckle but David explained that the QR buckle would be the better option and I could retrofit a buckle of my choice if I so required, I did…so I did. Once we were both happy and David was clear with what I required it was put into production. A quick note here, I'm not sure if BritTac holds a stock of readymade kit or if they manufacture to order but your stuff usually arrives by courier about a week later more or less with standard delivery. The manufacture and quality of the belt was to the standard that I’ve come to expect of BritTac and the one query I did have regarding where the webbing of the belt is attached to the padding and the possibility of webbing rash as quickly addressed by David and once again he was proved correct. The belt itself is well padded and comfortable to wear when fully loaded, not that I have to do the silly stuff much anymore but any fool can be uncomfortable. Not a lot I can say about this, it's a strap, it fits across your sternum…Two pieces of 19mm Murdock webbing again, joined with a small QR buckle and a removable tri- glide on each end which also allows for the strap to be switched between Bergans, Daysacks etc. It's a simple design and it does the job well. Always handy to have somewhere close to hand for Slate cards, TAMs, notebooks, compasses and other bits of stationery that tend to be required nowadays. Attention to detail is evident with internal webbing loops for pens, two pulls for the top opening zip and a central drain hole preventing all the usual stuff from accumulating in the bottom. The pouch itself takes up 4 columns and will only stick out as much as you fill it! I have no concerns about both the security of my ammo pouches to the front using the PALS there nor the complete package to the belt. British Tactical’s MOLLE attachment took me by surprise when I first saw it and I wasn't too sure of it, now…I'm more than happy with how it works and its security, provided you thread it properly it's not going to come off. MOLLE T Mount - QR female Buckle. This simply threads through the top row on the belt, the male part is on my helmet and keeps it neatly out of the way but handy should I ever need it. This is only for the bayonet (sword) and not the scabbard, there is a High-Density Plastic insert to prevent the ultra-sharp blade from damaging the material…which they will replace free of charge if it ever wears out. The insert combined with the hilt retaining strap, which is Multicam and the snug fit of the sheath itself ensures the Bayonet (Sword) stays securely in place. It only takes up a single column of PALS should you wish to mount it on the belt, it will just as easily fit onto the side PALS of any pouch that has it if space is at a premium, even on the lid of a pouch if you are so inclined, you could really be a rebel and have it attached to the rear webbing straps of the yoke…see the pictures below. As stated it only takes up one column and makes up for it by having a column of 4 rows on its face to allow for, well whatever you want so long as it only takes up a single column, a pistol mag pouch for a torch, multi tool maybe. Again, the manufacture and quality control is solid as is attention to detail. As they are basically the same just different sizes I'll group all three together, here's where the options David and his team give you start to come to the fore, you can have PALS on every face of the pouches that's what flips your switch, even the base I'd imagine, it's not on the drop down when you order but I'm sure the guys could and would do so if you really really wanted it. Personally, I opted for PALS on both sides on all three and on a lid for both a vertical and medium pouch “why not, it may come in handy” I thought… I could always fit a bayonet there if I wanted…or more sensibly, in my opinion, a Cylaume or Mocking Bird for I.D. purposes. There is only space on the lids for two rows on the vertical with space for three on the medium, which makes sense as it coincides with the number of columns each pouch takes up on your belt, vertical two and medium three and they near enough line up with the PALS on the belt. Internally on the vertical there is a sleeve/pocket for keeping odds and sods, spork, those anti-bacterial wipes from the rat pack, lighter etc. in one place and out of the way. The main compartment on the vertical is easily big enough for a 1lt Nalgene bottle and cup or the Trangia mess tin, new issue gel cooker and a brew kit with the medium pouch being able to take the issue metal mug, water bottle and BCB Crusader cooker unit without having to rip fingernails off trying to get them out. BritTac also give you the option to have a Stealth Admin Pouch integrated to your pouch, I hasten to add although it is integral it is separate from the pouch, I.e. there is a material divide and therefore no cross contamination between the two. The size and therefore capacity of the Admin Pouch is dependent on the Utility Pouch you choose to include it on as it covers the entire rear of the host Pouch and had a single zip closure on both the vertical and medium. Now onto what I can only describe as an amazingly adaptable ammo pouch, I opted for another double mag pouch so I could use it to carry an Airwave type radio if so required. On first appearance it looks pretty much like most other mag pouches on the market, what makes it so universal and adaptable then? Taking a second look all the internal surfaces have a loop field, more on that in a bit. The flap/lid is height adjustable enabling the pouch to take mags of various types, I've only access the issue tissue HK and Magpul E mags so I can only vouch for them, David assures me most other types will fit, hence the Universal in its name. “Aaah but it's secured by Velcro, I don't like Velcro, it's noisy” I hear you say, well David and his team have thought of that and have produced a silencer kit. This is basically a male and female QR setup that attaches to the pouch through the webbing loops on the lid and the base of the pouch, see the photos below, there is also a video on BT Facebook page explaining how it goes together. “I don't like lids/flaps on my ammo pouches it slows my reloads down” or “I prefer shingles” well guess what? BritTac has you covered, remember the loop fields inside the pouch? Here where they start to come into play, first off, the lid is removed, it's held in place using hook and loop. They also have available a CQB insert capable of holding two mags that fits inside the pouch giving you the shingle you want for CQB, BTW rotate this insert through 90degrees and I reckon it'll secure that radio I mentioned earlier…I reckon. “That's all well and good but the shock cord can get all tangled up” fussy bugger, aren't you? Once again BritTac seems to be one step ahead and will be producing Kydex inserts once R&D are happy with the product, I'm fortunate enough to get my grubby mitts on one to muck around with. First impressions are favourable, again using the loop fields inside the insert fits quite easily and securely inside although it is recommended by David that the retention shock cordon the pouch is rerouted, once again a video will appear on their Facebook page showing this but see below, this will secure the insert and magazine where there is the most stress on it. What I must emphasise is that the Kydex insert will cut the capacity down to just a single mag in a double pouch. The insert makes the magazine easy to grab and where necessary to put back, once in you can be sure the magazine isn't going to come out accidentally. So, to sum up this Pouch, lid on, silencer buckles, lid off, CQB, Kydex or radio insert, that's it right? Not quite, in the pipeline there is a laser cut laminate flap…guess who has got one, Jealous yet? It looks odd, I'm used to seeing binding or at least a hem of stitches, not so on this piece, I have been reliably informed that certain people have been playing with this sort of stuff for a wee while now in various environments and so far, there's been no delamination of the product. I can say that it is robust and I've been unable to tear a hole in it or even tear the slots cut in it yet. The slots are there to fit the buckle kit if so required just like the standard lid. Overall then, all the hardware on the pouches are ITW NEXUS FASTEX buckles, the PALS on the pouches are the Murdock woven Multicam and on the belt, it's the OG stuff as per issue as is the MOLLE, the binding on everything is a dyed MTP match that is used on the issue kit making everything aesthetically pleasing. All materials are to U.K. Mil spec and British Tactical give a lifetime defect warranty, not bad eh? Everything is made to a high spec and is bar tacked where appropriate. Try as I might I haven't found any loose threads or missed stitches. Okay so I have got a freebie or two from them, I like to think of it as a loyalty bonus scheme… does this make me biased? I'd like to think not, SOLID C and all that, also BritTac is not my sole point of call to satisfy my Kit Tart addiction, but I have found the company very easy to work with and very helpful right from the first time I used them, the Issue Patrol Sack/Predator 45 Pack side pouches they sell? That was in conjunction with David. Don't let the relative low cost of the kit put you off, they could easily charge more than they do. British Tactical produce kit to a high standard in both materials and finish without crippling your bank balance, they are very approachable and willing to listen to suggestions. The Everyday is a School Day bit. *PALS or Pouch Attachment Ladder System is a grid of webbing equipment invented and patented by United States Army Natick Soldier Research, Development and Engineering Centre used to attach smaller equipment onto load-bearing platforms. *MOLLE (pronounced /ˈmɒl.liː/, as in the female name) is an acronym for Modular Lightweight Load-carrying Equipment. It is used to define the current generation of load-bearing equipment.